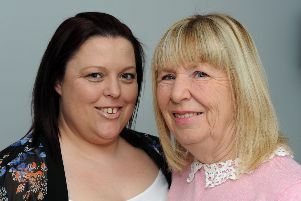 When Sutton mum Claire Meakin was pregnant 21 years ago, she was preparing to become a parent for the first time in her life. However, she had no idea what was on the horizon. It had not been an easy pregnancy for Claire, with an ectopic scare at the beginning and a scare with Down syndrome towards the end, however the real pain came once her baby Liam was born. Baby Liam, who was born at 38.5 weeks on May 31 1998, arrived after Claire suffered severe pain and was taken into surgery “within minutes” of being spotted by a midwife - who said to her “you do not look well”. It transpired that Claire had suffered a blood clot causing the baby to pull away from the placental wall, and when Liam was born he was not breathing and had no heartbeat. Claire and her family then went through a rollercoaster of emotions as the baby lay in a hospital bed, not knowing how long Liam would have and being told by doctors that it did not look promising. Sadly, Liam died within 37 hours of his birth. Approaching what would have been Liam’s 21st birthday, Claire has spoken of the heart-wrenching moment she was told her baby might die. She said: “Liam was born at 9.57pm on the Sunday. “I was really ill and Liam was taken to special care - he wasn’t born breathing and had no heartbeat. “The doctor came to me on the Monday morning and told me he was a very poorly boy, that they weren’t sure what the prognosis was and that the outcome would not be a good one. Once Claire realised her time with Liam was short, she ensured every minute spent with him was cherished. She began to understand that she needed to come to terms with it, realising that if Liam survives, he may be alive but he would not get “quality of life”. This is when she accepted that it was “time to let go”. “We quickly arranged for Liam to be christened and on the Monday it was becoming clear he was getting more poorly”, she said. “We spent a lot of time in SCABU (special care baby unit) and the staff were fantastic, we were lucky because he had his own room and we had easy access to him. “That evening Liam’s heart rate plummeted - I was holding him at the time saying ‘no he’s mine leave him alone’. “To be honest I thought to myself that, yes he might be living, but it was never going to be quality of life. “They took us into our own flat in SCABU and he was on oxygen, there was nothing else to support him and they said to me ‘this could be days and we can’t say how long he will be with us’. “He deteriorated quickly and within 30 minutes we had lost him. Despite Liam’s short life and sudden death, the Meakin family have made it their mission to remember him in every way they can - celebrating his birthday every year without fail. However, this year is a special year in his story with May 31 marking what would have been Liam’s 21st birthday - and to celebrate his memory they have organised a charity masquerade party aptly named ‘From Liam with Love’. The event, which will take place on June 1 at the Civic Quarter in Mansfield, will be a “big celebration of Liam” and is raising funds to support the bereavement midwives at King’s Mill Hospital in Sutton. Their aim is to fund a number of ‘cuddle cots’ for the hospital, which cost about £1,700 and act as a cooling pad for the baby’s body - giving families precious time to grieve and spend time with their baby. To organise the charity ball, Claire recruited the services of her brother Joel Meakin, 31, who is an events manager in Ashfield. The family wanted to put on a big party which also raises awareness for the cuddle cots cause. The ball will host a charity raffle and auction, with funds going towards the cuddle cots, before turning into a party at night with live music, entertainers and other surprises. Speaking on the event, Joel said: “For Claire this was a natural progression because it’s his 21st, thinking ‘what can we do’, and normally people have a party so we will have one. “Although it will have a sombre side because it’s about people losing children after birth, during the night there will be a point where it shifts to being a celebration. Priced at £21 per ticket, the family hope that £10 from each of the 300 tickets can go towards a cuddle cot and, with the raffle and auction, help to fund at least two units and any added bonuses. Claire and Joel have called on people to “give the gift of time” by attending the masquerade ball, helping families to make precious memories with their baby “which will last a lifetime”. She said: “We’re wanting to celebrate the time and memories we had with Liam and, as a result of the funds, provide memories for other families too.